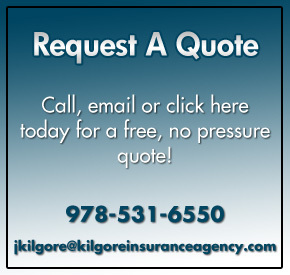 Kilgore Insurance is a full-service insurance agency specializing in car, homeowners, commercial coverage’s and life products. Based in Peabody, Massachusetts, Kilgore Insurance Agency has been keeping families throughout the North Shore safe for over seventy years. With an unwavering commitment to personal communication and superior service, our experienced professionals can help you find the coverage you need within the budget you want. Our premiums and services are competitive and advanced because of the variety of premier insurance providers we represent. Our insurance companies in Massachusetts include Hanover Insurance, Safety Insurance, Commerce Insurance, Merrimack Mutual Insurance, One Beacon Insurance and many specialized companies for workers compensation coverage and commercial accounts. The staff of Kilgore Insurance combined has over 100 years of experience, giving us the knowledge necessary to solve any insurance question you have. Every staff member is trained in reporting claims, it’s their highest priority. Second generation owners, Jeff and Cy Kilgore, are the principles of Kilgore Insurance, with over 30 years at the agency each. As a family-owned business, Jeff and Cy and their team are committed to treating each customer as well as they would a family member. The core value at Kilgore Insurance is to provide you and your family with excellent coverage while lowering your premiums.